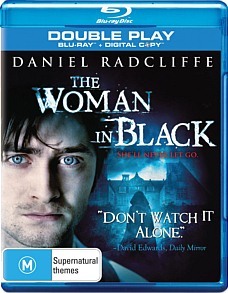 The Woman in Black Blu-ray Review. Fog, graveyards, lanterns, creepy Victorian-era childrens’ toys, a mansion. The Woman in Black has all the elements of a traditional horror story, and it puts them to sublime use. This is a movie that sets out to keep you on edge, consistently, for an hour and a half. And that it does. Daniel Radcliffe plays Arthur Kipps, a young man who is mourning the death of his bride in childbirth. As part of his job with a law form, he is sent to a small English village to investigate the will of a recently deceased woman. When he arrives, he gets a frosty reception from the locals. The woman he is investigating, the ‘Woman in Black,’ is said to still be roaming the grounds of her manor house. Anyone coming into contact with her is thought to bring untold misery on the town. In terms of structure, the story is a basic one. It promises several different subplots early on, but none of these are fully explored. It soon becomes clear that their aren’t that many pieces to the puzzle that Radcliffe’s character is trying to solve, but the film is going to tiptoe to each one in its own good time. A large number of scenes take place inside the house, with Daniel Radcliffe the sole actor. This sets up a perpetually creepy atmosphere, even if much of the movie is simply Radcliffe creeping down corridors, investigating one scary noise after another. The Woman in Black doesn’t use anything new or radical to scare you; it uses the same techniques that have worked for filmmakers for decades. All throughout the feature, you’re constantly aware of the devices that are being employed: The tight framing, the use of vertical lines, the camera angles that never quite let you see into that dark corner. But knowing doesn’t make them any less frightening, especially when they’re executed this well. Every scene is an opportunity for the filmmakers to scare you, and it’s an opportunity they’ve seized on. You’ll know the next bang, or the next ghostly face, is coming, but you won’t know when, or from where. Once it gets going, the Woman in Black will rarely let you feel comfortable. The colour palette is suitably sombre for a movie of this type, with lots of blues and greys. There is a heavy use of fog, and an abundance of flickering candles. The deep blacks really help build a scary atmosphere here. The visuals are crisp, but they never reveal too much and spoil the illusion. The soundtrack is rich and diverse, and perfectly complements the visuals. At any one moment you might hear ethereal voices, the distant neighing of a horse, or the bangs and crashes that are par for the course in a horror film. At times the soundtrack is a little too traditional; the appearance of a ghostly face in the window is always accompanied by a loud orchestral crash, for example, and it feels like you have to take your cue to be frightened. It would be more chilling if you were to slowly come around to noticing it yourself. No Fear- Daniel Radcliffe as Arthur Kipps: The lead actor and Director James Watkins speak about the central role. Inside the perfect thriller- the making of: This is a nicely in-depth documentary, and features comments from most of the key actors and crew, as well as the author of the novel, Susan Hill. Fog, graveyards, lanterns, creepy Victorian-era childrens’ toys, a mansion. The Woman in Black has all the elements of a traditional horror story, and it puts them to sublime use. This is a movie that sets out to keep you on edge, consistently, for an hour and a half. And that it does.